Objective: Support, and therefore relieve, the metarsophalangeal joint of the big toe. Application: A tape “anchor” is applied around the forefoot behind the toe pad (A). 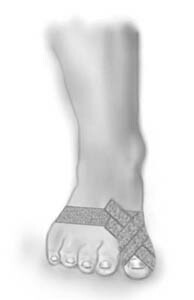 2-3 strips are applied from the anchor on the back of the foot around the big toe, and back to the anchor on the back of the foot (B).